Credit scores are based on a calculation system derived by FICO (Fair Isaac Corporation): a company that developed a rating system to apply to your credit report that predicts how good or how risky you are with your credit. Payment History: Your payment history makes up 35% of your credit score. It scores on how you’ve repaid your credit cards and loans. Missed or late payments and collections lower your score. Bankruptcy, credit counselling, settlements and liens also lower your score. What You Owe: The amount you owe is 30% of your credit score. The amount you owe on credit cards, credit lines and other revolving credit is compared to your total credit limit. On loans, the amount you owe is compared to the original amount borrowed. If you owe more than 75% of your total credit limit, your score drops. Length of Credit History: The length of time you’ve had and used each account is 15% of your credit score. The amount of time since the last activity on the account makes up part of this score. New Credit: The new credit section is 10% of your score. It consists of recent credit inquiries and the time since the inquiries were made. The new credit section also scores on accounts recently opened and the time since they were opened. 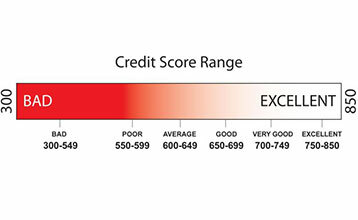 An important part of this score is how you’ve rebuilt your credit after credit problems. Types of Credit Used: The type of credit used is 10% of your credit score and reports on the types of loans or revolving credit you’ve used.